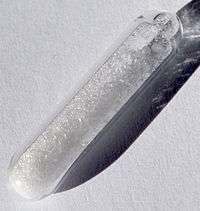 Europium is a chemical element with symbol Eu and atomic number 63. It was isolated in 1901 and is named after the continent of Europe. It is a moderately hard, silvery metal which readily oxidizes in air and water. Being a typical member of the lanthanide series, europium usually assumes the oxidation state +3, but the oxidation state +2 is also common. All europium compounds with oxidation state +2 are slightly reducing. Europium has no significant biological role and is relatively non-toxic compared to other heavy metals. 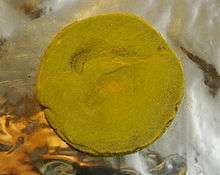 Most applications of europium exploit the phosphorescence of europium compounds. Europium is one of the least abundant elements in the universe; only about 6992500000000000000♠5×10−8% of all matter in the universe is europium. Europium is not found in nature as a free element. Many minerals contain europium, with the most important sources being bastnäsite, monazite, xenotime and loparite. Depletion or enrichment of europium in minerals relative to other rare earth elements is known as the europium anomaly. Europium is commonly included in trace element studies in geochemistry and petrology to understand the processes that form igneous rocks (rocks that cooled from magma or lava). The nature of the europium anomaly found helps reconstruct the relationships within a suite of igneous rocks. 4 (Ln denotes a mixture of all the lanthanides except promethium), and the third is a fluorocarbonate LnCO3F. Monazite also contains thorium and yttrium, which complicates handling because thorium and its decay products are radioactive. For the extraction from the ore and the isolation of individual lanthanides, several methods have been developed. The choice of method is based on the concentration and composition of the ore and on the distribution of the individual lanthanides in the resulting concentrate. Roasting the ore and subsequent acidic and basic leaching is used mostly to produce a concentrate of lanthanides. If cerium is the dominant lanthanide, then it is converted from cerium(III) to cerium(IV) and then precipitated. Further separation by solvent extractions or ion exchange chromatography yields a fraction which is enriched in europium. This fraction is reduced with zinc, zinc/amalgam, electrolysis or other methods converting the europium(III) to europium(II). Europium(II) reacts in a way similar to that of alkaline earth metals and therefore it can be precipitated as carbonate or is co-precipitated with barium sulfate. 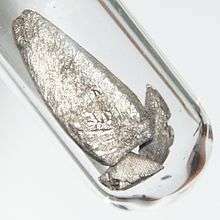 Europium metal is available through the electrolysis of a mixture of molten EuCl3 and NaCl (or CaCl2) in a graphite cell, which serves as cathode, using graphite as anode. The other product is chlorine gas. A few large deposits produce or produced a significant amount of the world production. The Bayan Obo iron ore deposit contains significant amounts of bastnäsite and monazite and is, with an estimated 36 million tonnes of rare earth element oxides, the largest known deposit. The mining operations at the Bayan Obo deposit made China the largest supplier of rare earth elements in the 1990s. Only 0.2% of the rare earth element content is europium. The second large source for rare earth elements between 1965 and its closure in the late 1990s was the Mountain Pass rare earth mine. The bastnäsite mined there is especially rich in the light rare earth elements (La-Gd, Sc, and Y) and contains only 0.1% of europium. Another large source for rare earth elements is the loparite found on the Kola peninsula. It contains besides niobium, tantalum and titanium up to 30% rare earth elements and is the largest source for these elements in Russia. Although europium is present in most of the minerals containing the other rare elements, due to the difficulties in separating the elements it was not until the late 1800s that the element was isolated. William Crookes observed the phosphorescent spectra of the rare elements and observed spectral lines later assigned to europium. Europium was first found in 1890 by Paul Émile Lecoq de Boisbaudran, who obtained basic fractions from samarium-gadolinium concentrates which had spectral lines not accounted for by samarium or gadolinium. However, the discovery of europium is generally credited to French chemist Eugène-Anatole Demarçay, who suspected samples of the recently discovered element samarium were contaminated with an unknown element in 1896 and who was able to isolate it in 1901; he then named it europium. Frank Spedding, celebrated for his development of the ion-exchange technology that revolutionized the rare earth industry in the mid-1950s, once related the story of how he was lecturing on the rare earths in the 1930s when an elderly gentleman approached him with an offer of a gift of several pounds of europium oxide. This was an unheard-of quantity at the time, and Spedding did not take the man seriously. However, a package duly arrived in the mail, containing several pounds of genuine europium oxide. The elderly gentleman had turned out to be Herbert Newby McCoy who had developed a famous method of europium purification involving redox chemistry. Europium is one of the elements used to make the red color in CRT televisions. Relative to most other elements, commercial applications for europium are few and rather specialized. Almost invariably, they exploit its phosphorescence, either in the +2 or +3 oxidation state. It is a dopant in some types of glass in lasers and other optoelectronic devices. Europium oxide (Eu2O3) is widely used as a red phosphor in television sets and fluorescent lamps, and as an activator for yttrium-based phosphors. Color TV screens contain between 0.5 and 1 g of europium oxide. Whereas trivalent europium gives red phosphors, the luminescence of divalent europium depends on the host lattice, but tends to be on the blue side. The two classes of europium-based phosphor (red and blue), combined with the yellow/green terbium phosphors give "white" light, the color temperature of which can be varied by altering the proportion or specific composition of the individual phosphors. This phosphor system is typically encountered in helical fluorescent light bulbs. Combining the same three classes is one way to make trichromatic systems in TV and computer screens. Europium is also used in the manufacture of fluorescent glass. One of the more common persistent after-glow phosphors besides copper-doped zinc sulfide is europium-doped strontium aluminate. Europium fluorescence is used to interrogate biomolecular interactions in drug-discovery screens. It is also used in the anti-counterfeiting phosphors in euro banknotes. 1 2 3 Holleman, A. F.; Wiberg, E. "Inorganic Chemistry" Academic Press: San Diego, 2001. ISBN 0-12-352651-5. ↑ Debessai, M.; Matsuoka, T.; Hamlin, J.; Schilling, J.; Shimizu, K. (2009). "Pressure-Induced Superconducting State of Europium Metal at Low Temperatures". Phys. Rev. Lett. 102 (19): 197002. Bibcode:2009PhRvL.102s7002D. doi:10.1103/PhysRevLett.102.197002. PMID 19518988. ↑ Hamric, David (November 2007). "Rare-Earth Metal Long Term Air Exposure Test". elementsales.com. Retrieved 2009-08-08. 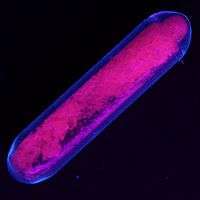 ↑ "Chemical reactions of Europium". Webelements. Retrieved 2009-06-06. ↑ Cooley, Robert A.; Yost, Don M.; Stone, Hosmer W. (1946). "Europium(II) Salts". Inorganic Syntheses. 2. pp. 69–73. doi:10.1002/9780470132333.ch19. ISBN 978-0-470-13233-3. ↑ Belli, P.; et al. (2007). "Search for α decay of natural europium". Nuclear Physics A. 789: 15–29. Bibcode:2007NuPhA.789...15B. doi:10.1016/j.nuclphysa.2007.03.001. 1 2 Nucleonica (2007–2011). "Nucleonica: Universal Nuclide Chart". Nucleonica: Universal Nuclide Chart. Nucleonica. Retrieved July 22, 2011. ↑ Tables of Nuclear Data, Japan Atomic Energy Agency Archived June 10, 2015, at the Wayback Machine. ↑ Oh, S.Y. ; Chang, J.; Mughabghab, S. (2000). "Neutron cross section evaluations of fission products below the fast energy region". doi:10.2172/759039. ↑ Inghram, Mark; Hayden, Richard; Hess, David (1947). "Activities Induced by Pile Neutron Bombardment of Samarium". Physical Review. 71 (9): 643–643. Bibcode:1947PhRv...71..643I. doi:10.1103/PhysRev.71.643. ↑ Hayden, Richard; Reynolds, John; Inghram, Mark (1949). "Reactions Induced by Slow Neutron Irradiation of Europium". Physical Review. 75 (10): 1500–1507. Bibcode:1949PhRv...75.1500H. doi:10.1103/PhysRev.75.1500. ↑ Meinke, W. W.; Anderson, R. E. (1954). "Activation Analysis of Several Rare Earth Elements". Analytical Chemistry. 26 (5): 907–909. doi:10.1021/ac60089a030. ↑ Farrar, H; Tomlinson, R.H. (1962). "Cumulative yields of the heavy fragments in U235 thermal neutron fission". Nuclear Physics. 34 (2): 367–381. Bibcode:1962NucPh..34..367F. doi:10.1016/0029-5582(62)90227-4. ↑ Inghram, Mark; Hayden, Richard; Hess, David (1950). "U235 Fission Yields in the Rare Earth Region". Physical Review. 79 (2): 271–274. Bibcode:1950PhRv...79..271I. doi:10.1103/PhysRev.79.271. ↑ Fajans, Kasimir; Voigt, Adolf (1941). "A Note on the Radiochemistry of Europium". Physical Review. 60 (7): 533–534. Bibcode:1941PhRv...60..533F. doi:10.1103/PhysRev.60.533.2. 1 2 3 Maestro, Patrick. "Lanthanides". Kirk-Othmer Encyclopedia of Chemical Technology. 14. pp. 1096–1120. doi:10.1002/0471238961.120114201901021. ISBN 978-0-471-23896-6. ↑ Sinha, Shyama P.; Scientific Affairs Division, North Atlantic Treaty Organization (1983). "The Europium anomaly". Systematics and the properties of the lanthanides. pp. 550–553. ISBN 978-90-277-1613-2. ↑ Bill, H.; Calas, G. (1978). "Color centers, associated rare-earth ions and the origin of coloration in natural fluorites". Physics and Chemistry of Minerals. 3 (2): 117–131. Bibcode:1978PCM.....3..117B. doi:10.1007/BF00308116. ↑ Allen, Robert D. (1952). "Variations in chemical and physical properties of fluorite" (PDF). Am. Mineral. 37: 910–30. ↑ Valeur, Bernard; Berberan-Santos, Mário N. (2011). "A Brief History of Fluorescence and Phosphorescence before the Emergence of Quantum Theory". Journal of Chemical Education. 88 (6): 731–738. Bibcode:2011JChEd..88..731V. doi:10.1021/ed100182h. ↑ Mariano, A; King, P (1975). "Europium-activated cathodoluminescence in minerals". Geochimica et Cosmochimica Acta. 39 (5): 649–660. Bibcode:1975GeCoA..39..649M. doi:10.1016/0016-7037(75)90008-3. ↑ Sidike, Aierken; Kusachi, I.; Yamashita, N. (2003). "Natural fluorite emitting yellow fluorescence under UV light". Physics and Chemistry of Minerals. 30 (8): 478–485. Bibcode:2003PCM....30..478S. doi:10.1007/s00269-003-0341-3. ↑ Przibram, K. (1935). "Fluorescence of Fluorite and the Bivalent Europium Ion". Nature. 135 (3403): 100–100. Bibcode:1935Natur.135..100P. doi:10.1038/135100a0. 1 2 Gupta, C. K.; Krishnamurthy, N. (1992). "Extractive metallurgy of rare earths". International Materials Reviews. 37: 197–248. ↑ Morais, C; Ciminelli, V.S.T (2001). "Recovery of europium by chemical reduction of a commercial solution of europium and gadolinium chlorides". Hydrometallurgy. 60 (3): 247–253. doi:10.1016/S0304-386X(01)00156-6. 1 2 McCoy, Herbert N. (1936). "Contribution to the chemistry of europium". Journal of the American Chemical Society. 58 (9): 1577–1580. doi:10.1021/ja01300a020. ↑ Neikov, Oleg D.; Naboychenko, Stanislav; Gopienko, Victor G.; Frishberg, Irina V. (2009-01-15). Handbook of Non-Ferrous Metal Powders: Technologies and Applications. p. 505. ISBN 978-1-85617-422-0. ↑ Lawrence J. Drewa; Meng Qingrunb & Sun Weijun (1990). "The Bayan Obo iron-rare-earth-niobium deposits, Inner Mongolia, China". Lithos. 26 (1–2): 43–65. Bibcode:1990Litho..26...43D. doi:10.1016/0024-4937(90)90040-8. ↑ Xue-Ming Yang; Michael J. Le Bas (2004). "Chemical compositions of carbonate minerals from Bayan Obo, Inner Mongolia, China: implications for petrogenesis". Lithos. 72 (1–2): 97–116. Bibcode:2004Litho..72...97Y. doi:10.1016/j.lithos.2003.09.002. ↑ Chengyu Wu (2007). "Bayan Obo Controversy: Carbonatites versus Iron Oxide-Cu-Au-(REE-U)". Resource Geology. 58 (4): 348. doi:10.1111/j.1751-3928.2008.00069.x. ↑ Hedrick, J; Sinha, S; Kosynkin, V (1997). "Loparite, a rare-earth ore (Ce, Na, Sr, Ca)(Ti, Nb, Ta, Fe+3)O3". Journal of Alloys and Compounds. 250: 467–470. doi:10.1016/S0925-8388(96)02824-1. ↑ Archer, R. D.; Mitchell, W. N.; Mazelsky, R. (1967). "Europium (II) Sulfide". Inorganic Syntheses. 10. pp. 77–79. doi:10.1002/9780470132418.ch15. ISBN 978-0-470-13241-8. ↑ Crookes, W. (1905). "On the Phosphorescent Spectra of S δ and Europium". Proceedings of the Royal Society of London. 76 (511): 411–414. Bibcode:1905RSPSA..76..411C. doi:10.1098/rspa.1905.0043. JSTOR 92772. ↑ Demarçay, Eugène-Anatole (1901). "Sur un nouvel élément l'europium". Comptes rendus. 132: 1484–1486. ↑ Weeks, Mary Elvira (1932). "The discovery of the elements. XVI. The rare earth elements". Journal of Chemical Education. 9 (10): 1751. Bibcode:1932JChEd...9.1751W. doi:10.1021/ed009p1751. 1 2 Srivastava, A. M.; Ronda, C. R. (2003). "Phosphors" (PDF). The Electrochemical Society Interface: 48–51. ↑ Spedding, Frank H. (1949). "Large-scale separation of rare-earth salts and the preparation of the pure metals". Discussions of the Faraday Society. 7: 214. doi:10.1039/DF9490700214. ↑ Corbett, John D. (1986). "Frank Harold Spedding". Biographical Memoirs National Academy of Sciences. National Academy of Sciences. 80 (5): 106. Bibcode:1986PhT....39e.106H. doi:10.1063/1.2815016. 1 2 Caro, Paul (1998-06-01). "Rare earths in luminescence". Rare earths. pp. 323–325. ISBN 978-84-89784-33-8. ↑ Bamfield, Peter (2001). "Inorganic Phosphors". Chromic phenomena: technological applications of colour chemistry. pp. 159–171. ISBN 978-0-85404-474-0. ↑ Gupta, C. K.; Krishnamurthy, N. (2005). "Ch. 1.7.10 Phosphors". Extractive metallurgy of rare earths (PDF). CRC Press. ISBN 0-415-33340-7. Archived from the original (PDF) on 23 June 2012. ↑ Lakshmanan, Arunachalam (2008). "Persistent Afterglow Phosphors". Luminescence and Display Phosphors: Phenomena and Applications. ISBN 978-1-60456-018-3. ↑ "Europium and the Euro". Retrieved 2009-06-06. ↑ Cotton, Simon (2006). "Euro banknotes". Lanthanide and actinide chemistry. p. 77. ISBN 978-0-470-01006-8. ↑ Richards, Stephen; Hollerton, John (2011). Essential Practical NMR for Organic Chemistry. ISBN 978-0-470-71092-0. ↑ Pavia, Donald L; Lampman, Gary M (2009). Introduction to spectroscopy. ISBN 978-0-495-11478-9. ↑ Wenzel, Thomas J (2007). Discrimination of chiral compounds using NMR spectroscopy. ISBN 978-0-471-76352-9. ↑ Cotton, Simon (2006). Lanthanide and actinide chemistry. ISBN 978-0-470-01006-8. ↑ Gschneidner, Karl A; Bünzli, Jean-Claude; Pecharsky, Vitalij K (2005). Handbook on the Physics and Chemistry of Rare Earths. ISBN 978-0-444-52028-9. ↑ Haley, Thomas J.; Komesu, N.; Colvin, G.; Koste, L.; Upham, H. C. (1965). "Pharmacology and toxicology of europium chloride". Journal of Pharmaceutical Sciences. 54 (4): 643–5. doi:10.1002/jps.2600540435. PMID 5842357. ↑ Bruce, D; Hietbrink, Bernard E.; Dubois, Kenneth P. (1963). "The acute mammalian toxicity of rare earth nitrates and oxides*1". Toxicology and Applied Pharmacology. 5 (6): 750. doi:10.1016/0041-008X(63)90067-X. ↑ Lenntech BV. "Europium (Eu) – Chemical properties, Health and Environmental effects". Lenntech Periodic Table. Lenntech BV. Retrieved July 20, 2011.